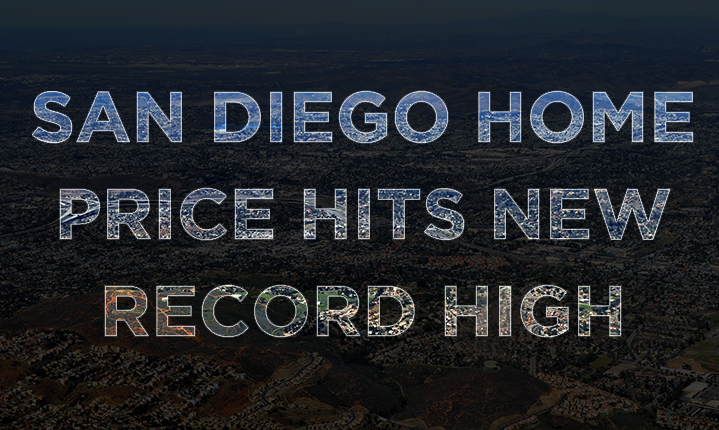 As of March 2018, the San Diego County median home price soared to its highest point ever, $550,000, said real estate tracker CoreLogic. Home prices increased 6.8% in a year, which experts attribute to a lack of homes for sale and a strong economy. The previous home peak was $545,000 in June. Let’s look at the big picture. San Diego County’s median home price is technically still down from the height of the housing boom. In November 2005, the median hit $517,500, which is more than $650,000 when adjusted for inflation. The San Diego region is still a cheaper option in coastal Southern California compared to Los Angeles and Orange counties, which also hit new price peaks in March, CoreLogic reported Monday. When it comes down to it, a strong economy is fueling demand for homes while the number of houses available remains limited, said Chris Thornberg, economist and founding partner of Beacon Economics. There were 4,857 homes listed for sale in March, said the Greater San Diego Association of Realtors. That is 488 more than March of last year. However, those listings are down from 5,652 in March 2016, 6,101 in 2015 and 6,223 in 2014. Homes are selling faster than they were last year – now at an average of 28 days on the market, down from 32 in 2017. Homes between $250,001 and $500,000 sold the fastest, an average of 23 days. Homes going for $1.25 million and up stayed on the market an average 58 days. The median for a resale single-family home hit $608,750, a new peak, in March with 2,126 sales. Resale condos were at a median of $418,000 with 1,038 sales, and down from a peak of $425,000 reached in February. Newly built homes were a median of $619,500 with 365 sales, down from a peak of $792,250. There were 3,529 home sales in March, down by 208 from the same time last year. Oceanside (92057) had the most sales, 82, with a median sales price of $477,000. It was followed by another Oceanside ZIP code, 92056, with 79 sales and a median of $529,000. For resale condos, downtown (92101) had the most sales with 90 and a median of $595,000. Rancho Bernardo (92128) and Mission Valley (92108) both had 42 sales each for medians of $455,000 and $343,000, respectively. Absentee buyers, typically investors who don’t intend on living in the home as a primary residence, made up 22.3 percent of all homes sold in March, up from 20.9 percent at the same time last year. In early 2013, more than 30 percent of sales went to absentee buyers. Southern California’s median home price hit a record high of $519,000 in March, increasing 8.4 percent in a year. Orange County had the biggest increase, 8.7 percent, for a median of $725,000. It was followed by San Bernardino County with a 7.5 percent increase for a median of $328,000; Riverside County with a 7.1 percent increase for a median of $375,000; San Diego County with the 6.8 percent increase; Los Angeles County with a 6.6 percent increase for a median of $585,000; and Ventura County with a 6.8 percent with a median of $656,000. There’s a lot to consider when buying and selling a home and we’re here to help. Please contact us here at San Diego at Home. We can be reached today by calling 619.356.1919. We look forward to speaking with you!